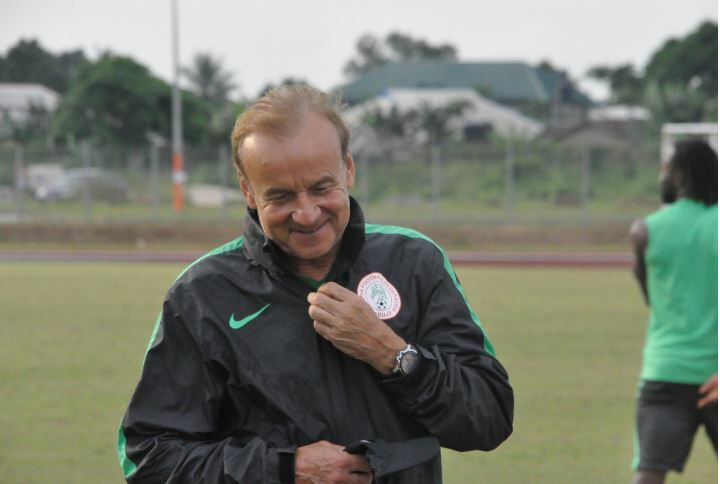 Head coach of the Super Eagles, Gernot Rohr, has released a 23-man squad for their final 2019 Africa Cup of Nations qualifying game against Seychelles on March 23. One of the notable absentees is Leicester City’s forward, Kelechi Iheanacho. However, Ahmed Musa, Kenneth Omeruo, Leon Balogun, Abdullahi Shehu and William Ekong, as well as midfielders Oghenekaro Etebo and Wilfred Ndidi and forwards Odion Ighalo, Alex Iwobi and Moses Simon, made the cut. Rohr has also named Flying Eagles’ defender, Valentine Ozornwafor, as well as former U17 World Cup winner, Victor Osimhen and Denmark–based Paul Onuachu. All invited players alongside technical and backroom crew, are to report in Asaba, the Delta State capital, on March 18, 2019. Nigeria have already qualified for the tournament. Goalkeepers: Francis Uzoho (Anorthosis Famagusta, Cyprus); Ikechukwu Ezenwa (Katsina United); Daniel Akpeyi (Kaizer Chiefs, South Africa). Defenders: Olaoluwa Aina (Torino FC, Italy); Abdullahi Shehu (Bursaspor FC, Turkey); Valentine Ozornwafor (Enyimba FC, U20 defender & Home-based); Chidozie Awaziem (Caykur Rizespor, Turkey); William Ekong (Udinese FC, Italy); Leon Balogun (Brighton & Hove Albion, England); Kenneth Omeruo (CD Leganes, Spain); Jamilu Collins (SC Padeborn 07, Germany). Midfielders: Semi Ajayi (Rotherham United, England); Wilfred Ndidi (Leicester City, England); Oghenekaro Etebo (Stoke City FC, England); John Ogu (Hapoel Be’er Sheva, Israel). Forwards: Ahmed Musa (Al Nassar FC, Saudi Arabia); Victor Osimhen (Charleroi SC, Belgium); Moses Simon (Levante FC, Spain); Henry Onyekuru (Galatasaray SK, Turkey); Odion Ighalo (Shanghai Shenhua, China); Alex Iwobi (Arsenal FC, England); Samuel Kalu (Girondins Bordeaux, France); Paul Onuachu (FC Midtjyland, Denmark).